His reason, amazingly, was to thank God Almighty for bringing him home safely, after undergoing almost six hours of plastic surgery in far away New York, in the United States. It was also to preach peace and encourage people in his homeland, Akomadan, and across the country to pray for peace ahead of the Supreme Court final verdict on Thursday. If Kwaku Bonsam’s appearance in the Church was not enough to surprise the worshippers, the mounting of the pulpit, which was granted him by the church, and the dexterity at which he preached the gospel, left many in awe. After taking the microphone from the Officiating Priest, Rev. Father Jospeh Akuamoah Boateng, the fetish priest made a series of quotations from the Bible, and asked the worshippers to join him in thanking God for his mercies towards him, and to Ghana as a country. 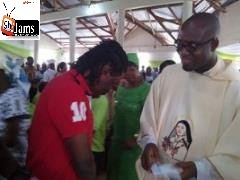 The occasion also marked the first mass service of the newly-ordained Catholic Priest, Rev. Fr. Joseph Akuamoah Boateng, who was a former classmate of Nana Kwaku Bonsam. The fetish priest of the ‘Kofi Kofi’ shrine said he wanted to disabuse the minds of many who believe that fetish priests are evil worshippers and do not believe in the Almighty God.